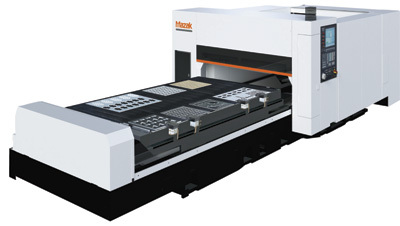 Mazak Optonics, Elgin, IL, will showcase a wide range of applications and demonstrate several new machines, including the debut of its fiber laser. Built on the company's Optiplex platform, the laser achieves extremely high speeds via an IPG fiber resonator, which reportedly yields faster cuts through thin gauge material and significantly reduces operating costs. The company's new OPTIPLEX 2D laser-cutting system with flexible two-pallet changer provides high throughput, AO/5 automated setup technologies and rugged construction. During booth demonstrations, show attendees will experience the machine's new user-friendly PreView II touchscreen control and new 4000-W type 10 resonator. Also on display: the SuperTurbo-X Mark III, with power output boosted to 6000 W; and a new modular material-automation system expandable to serve one to four laser-cutting machines.